Virtual reality (VR) technology is no longer just for gamers or techies interested in the next big thing. Decreasing costs, scalability and interest from researchers have moved VR onto the healthcare radar as well. Although its use in the medical world is still far from mainstream, VR has found its way into arenas that can immediately impact patients and physicians. Here are five ways in which virtual reality has the power to transform the healthcare sector. 1. Greater hands-on experience in medical education. One of the biggest challenges in medical education is providing medical students and post-graduate trainees with real-life, hands-on experience while still keeping patient safety at the forefront. One way to accomplish this is through the use of simulation systems. For example, the Center for Virtual Care at the UC Davis School of Medicine uses instructional simulators to teach students hands-on techniques in a safe and relaxed setting, which “allows students to practice a variety of medical situations in a supervised learning environment.” Another use of VR in medical education is the promotion of instructor development through simulation tools such as mechanical models and virtual reality simulators, as seen in a program at Penn State Health’s Simulation Center. Using VR in medical training decreases students’ anxiety while increasing their experience in a virtual setting. VR gives students the opportunity to use appropriate health literacy language to describe illnesses, tests and procedures, and also allows them to develop critical qualities such as empathy. In addition, it offers them hands-on training in an array of minimally invasive procedures which, with simulation practice, can minimize the complications experienced by patients. How Can You Revolutionize the Patient Experience? 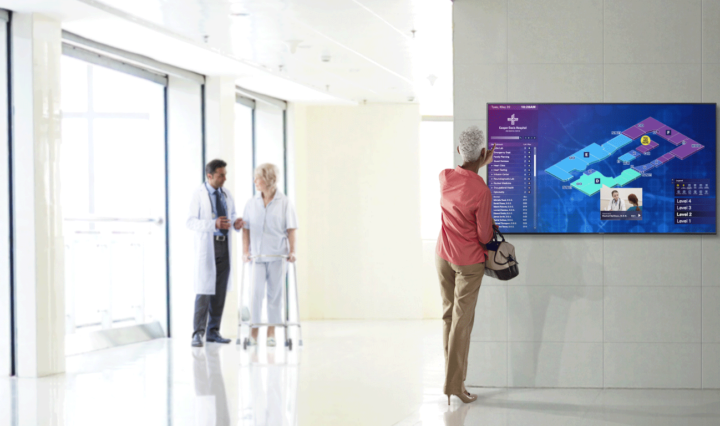 See how innovative hospitals are using digital technology to keep patients happy and healthy. 2. Enhanced ability to monitor patients during surgery. VR has been utilized in the training of surgeons for the past few years, and its use has been shown to shorten the learning curve of some operational procedures. At Angers University Hospital in western France, physicians have taken this a step further by using VR while mapping the brain during neurosurgery. To monitor the patient’s sight, the surgical team “created a virtual environment without a single point of focus” so they could observe the patient’s brain’s reaction to objects in their peripheral vision. This enhanced insight into the patient’s brain allowed them to keep the patient’s sight intact in the weeks following surgery. 3. Improved patient education. Patient education covers many areas, from learning about diagnoses and medications to understanding tests and procedures. Recently, the clinical research organization Quintiles has announced it will use VR for recruitment of patients into clinical trials. As VR takes the patient through the journey of learning what’s involved in the clinical trial and conveys it as an interactive experience rather than something in which they are passive subjects, it will decrease distraction and offer visualizations that can promote better understanding of the study, according to John Reites of Quintiles. 4. Ability to use interactive experiences to lessen patient pain. Using virtual reality to enhance the patient experience isn’t new. A project utilizing VR for patients with disabilities was described as far back as 1994. The patient experience in the outpatient as well as the hospital setting can be very intimidating, and presents many challenges for even the most confident patient or caregiver. There’s huge potential for VR to increase patient relaxation, and it’s also been developed and found useful for the assessment and treatment of post traumatic stress disorder by allowing patients suffering from PTSD to gradually “relive” the trauma-inducing event so they can begin to process the emotions associated with it. Additional uses for VR for patients include using it as an adjunct to treatment of patients experiencing significant pain and in physical therapy through an underwater VR game to assist multiple sclerosis patients with balance. The VR field is becoming a rapidly appreciated and economically feasible digital health technology, and VR is ready to assist healthcare enterprises, clinicians, patients and caregivers by providing the best technical support. The Samsung Gear VR is at the forefront of this exciting part of the digital healthcare movement. How Smart Are Your Clinical Communications? Get personalized advice on how to improve your hospital's use of technology. What Should Healthcare Providers Focus on in 2019?